I think the thrill of the hunt is part of what makes this hobby so enjoyable. Going into a new store or happening upon a pipe in an unlikely place, never knowing just exactly what you are going to find and always keeping a lookout for that forgotten gem. This past summer I was on vacation with my family in Seaside, Oregon. Between Seaside and Astoria I visited 14 different antique stores and only two had any pipes at all. And of those, they were all on the pricy side; too rich for me. Partly on a whim and partly out of desperation, I went into a second-hand store that I had passed by several times. It was more “junk” than “antique” and of course that is where I made my score although I didn’t think so at first. Three pipes: the first was a non-briar volcano with “Italy” stamped on the bottom, the second was a Medico that was in such bad shape it could only be used for parts but the third was intriguing with a silver band. I could not read the markings for all the filth on the pipe. I negotiated with guy behind the counter and walked out will all three for $15. It was clear that this had been a very nice pipe in its day. The wood grain that could be seen through the grime was beautiful and the Army Style push stem I thought gave the pipe a classy feel. When I got it back to the house and looked it over in better light, I noticed that the band had been rotated on the shank so the writing was upside down and in the dim light of the store I could not read it. Now I could see that it clearly said “Peterson” and “Dublin” stamped in the silver band. A Peterson, my heart skipped a beat. I was well aware of Peterson’s long history of making quality pipes and now I had picked up an early model for 5-bucks! The bowl had a good build up of cake and a fair amount of unburned tobacco in the bottom. Some build up of tars on the rim but otherwise seemed to be in good condition. The shank had clearly been broken, however and the glue used for the repair was spread all over one side of the bowl. The stamping on the band, as stated before, were worn and not very readable. The stem was oxidized and had a hole in the top near the button. This must have been a favorite pipe of the previous owner. When I got home from vacation, I tried to understand the symbolic hallmarks on the band. Not being familiar with Peterson marking I sent a picture to Steve Laug to ask his opinion. Steve very graciously referred me to his Peterson expert, Mark Irwin. With Mark’s help I was able to understand Peterson’s hallmarking and dated the pipe as 1929 – placing it in the Irish Free State era: 1922 – 1937. At least, that was my interpretation of the third hallmark, an “O”. I began by reaming out the cake with a Castleford reamer and took the interior back to bare wood. There were some burn marks under the tar on the rim so I elected to top the bowl with some 220 grit paper laid on the flat work bench. Next I heated the band with a flame and then using leather jawed pliers and carefully rotated the band back into correct alignment. The outside of the bowl I wiped down with a cotton pad soaked in acetone. This removed the grime and the glue. I had been worried that the glue was covering a crack in the bowl but it turned out that the person doing the shank repair had just been sloppy. The glue came away and revealed pristine briar underneath. In just the right light, I also could see a very faint IRISH FREE STATE stamped into the bottom side of the shank – Confirmation! The break between the bowl and the shank had been complete. I could see the seam all the way around the shank but it had been a clean break. There were no gaps, rounded edges nor missing pieces; so far, so good. At this point I turned my attention to the stem. I put the stem to soak in a mild chlorine bath to raise the oxidation. A light sanding with some worn 400 grit paper removed the oxidation completely. I picked the loose material out of the hole, made backing plug out of toothpicks and slipped it into the airway. This would hold my patching material in place. Next I mixed up some StewMac black super glue with some activated charcoal powder and worked it into the hole with another tooth pick. I set the stem aside to cure over night. When I came back to the stem I sanded down the fill with 220 grit paper. The plug blended nicely and I proceeded to polish the stem with 1500 – 12000 micromesh pads. Cleaning the inside of the stem was quite simple, four of alcohol soaked pipe cleaners (2 bristled and 2 soft) took care of the insides and the stem was done. Returning to the stummel, I began to work the bowl-shank joint back and forth with ever increasing force. I caught myself holding my breath, afraid of breaking the pipe beyond repair but dismissed that thought as fear of the unknown and pushed on. Eventually the crack began to open up and the shank and bowl were separated. I was surprised to see that the original repair had included two small brads – or pins – set on either side of the air hole to strengthen the break. Since the brads were already in proper alignment I decided to reuse them in my repair. After some research, I settled on the J-B Kwik Weld as my epoxy of choice. Its resistant temperature is less than that of original J-B Weld (300 vs 550 degrees); however, I do not think the shank should reach 300 degrees during a smoke. But the real advantage in my minds was that the set time is only 6 minutes compared to 4-6 hours. I didn’t want to have to come up with a way to hold the two parts together for several hours and risk the parts slipping. In order to keep the airway clear during the repair, I pushed a pipe cleaner through the airway before smearing the epoxy on the both surfaces with a tooth pick. With the clock running on the set time, I pushed to the two parts together using the old brads as alignment pins. Looking back I think it would have been better if I had only used one of the pins. The fit was tight and I was fighting against the pins to get the two parts tight together when the time ran out on the epoxy. I was left with a larger gap between the pieces than I thought was right; I had been hoping for a flush fit. Before setting the pipe aside to cure I wiped off the excess epoxy and removed the pipe cleaner. I let the pipe sit overnight and the next day I used a dental pick to remove some of the epoxy from the gap between the stummel and bowl. The gap was very small, less than a 1/32 of an inch on top and near flush on the bottom. When the crack was as clean as I could get it, I filled it with briar dust and placed drops of clear super glue on top to hold the dust in place. When the super glue dried I smoothed out the repair with 220 grit sand paper. There were some minor dents in the bowl and I decided to steam them out by wrapping the bowl with a damp terry cloth rag and going over the rag with a clothes iron set on high. If you used this method I would advise keeping your figures well clear of the iron. Speaking from personal experience, you don’t have to be very close to the iron get burned by the steam. Fortunately, I did not drop bowl! I sanded the entire bowl with 400 – 2000 grit paper to remove all the dents and scratches but being sure to stay clear of the marking on the shank. The markings were faint but I wanted to preserve as much of them as I could. The bowl had beautiful grain and I wanted to use a light brown stain to highlight it. I used one part Fiebing’s light brown mixed with 2 parts isopropyl alcohol applied with a cotton swab in layers until the color looked just right. I flaming each layer and wiped off the excess with a cotton pad moistened with alcohol. The next to last step was to polish the sterling silver band. For this I tried a new technique that I had recently learned on this blog using a small amount of cigar ash and saliva. I was careful not to polish too much – or at all – around the hallmarks. The final step was a trip to the buffer for three coats of carnauba wax on the briar and stem. I hand applied a light coat of Walker Briar Works carnauba wax sealer on the silver band and I buffed the pipe with a micro fiber cloth to bring up the shine. This entry was posted in Pipe Refurbishing Essays and tagged Aaron Henson article, article by Aaron Henson, bite marks, Bowl - finishing, Bowl - refinishing, bowl topping, Bowls - refinishing, contrast staining, finishing, micromesh sanding pads, Oxidation, Peterson, Peterson 1929 Irish Free State Billiard, pipe refurbishing, polishing a stem, rebreaking and repairing a broken shank on a Peterson Billiard, refinishing, refurbishing, removing oxidation, removing tooth marks, repairing a bite through on a vulcanite stem with black super glue, repairing a bite through wiht black super glue, repairing a broken shank on a billiard, repairing a broken shank on a Peterson billiard, repairing bite marks, repairing tooth marks, restaining a bowl and rim, Stem repairs, stem work on November 29, 2015 by rebornpipes. 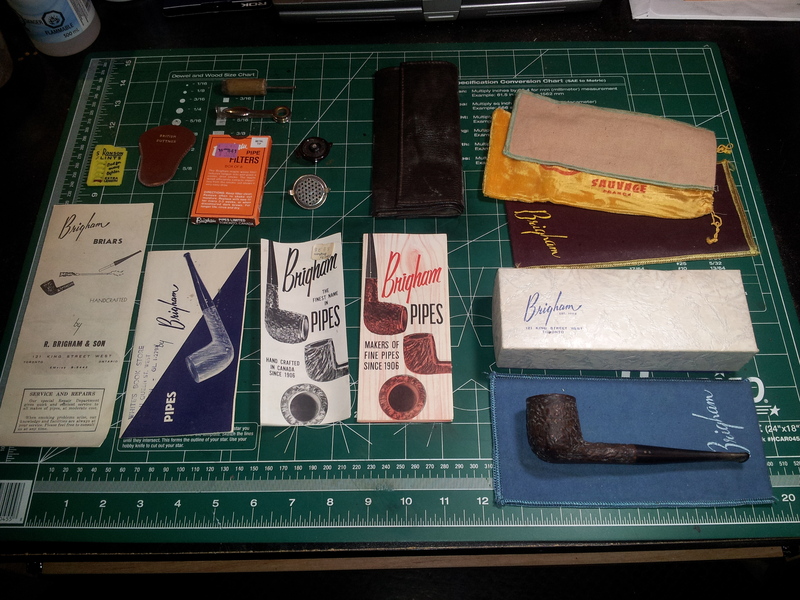 I just finished cleaning up the last of the pipe I picked up from the antique malls while I was in Idaho Falls. It is a little Dr. Grabow bent billiard. It is stamped on the left side of the shank Dr. Grabow over De Luxe over Imported Briar. On the right side near the stem shank union it is stamped with the shape number 9704. From what I can find on the Grabow shape charts the 04 shape is the bent billiard. This one was in rough shape. The finish was basically worn off and the bowl had spots of sticky grime on the sides and shank. There were also spots of paint on the shank and bowl. There were scratches all over the bowl. There were a lot of small fills on the right side of the bowl and the top of the shank as well as a large one on the lower part of the front of the bowl. Because of the missing finish these stood out. The top of the rim had a buildup of tars that looked flaky and hard. The bowl had a thick cake that made it impossible to see if the inside of the rim was in decent shape. I would need to ream it back to be sure. The stem was oxidized and the dirty with light tooth chatter on the underside near the button. I took a close up photo of the top of the rim to show what I had to work with in cleaning up the bowl and rim. When I took the stem off the pipe it had the usual Dr. Grabow shovel stinger apparatus. This was a little unique in that it was not inserted into the metal tenon but was an integral part of the tenon. The two were cast together which made removing it impossible. It was covered in tars and in a tobacco coloured lacquer that was rock hard. The next two photos show the stamping on both sides of the shank. The right side shows the clear shape number stamp and the left side the Dr. Grabow stamping. The Imported Briar stamping is weak but visible. I reamed the bowl back to bare wood with a PipNet reamer. I started with the smallest cutting head and worked my way up to one that was the same diameter as the inside of the bowl. Once the cake was cleaned out I used a pen knife to clean up the small ridge that shows up in the second photo below. I used a sanding sponge to lightly top the bowl. The tars and lava on the top were hard and this was the way I chose to remove it without damaging the finish to the rim. I worked on it until the rim was clean and smooth. It would still need to be scrubbed to remove the darkening. I scrubbed the rim and the bowl with acetone on a cotton pad to remove the grime and oils left in the finish. I scrubbed until the rim and bowl were clean. I scrubbed the shovel stinger with 0000 steel wool to remove the buildup on the aluminum and polish it at the same time. I cleaned out the shank with alcohol, pipe cleaners and cotton swabs until it was spotless. I then worked on the stem. It was made a bit more difficult with the built in stinger but I was able to get it clean with a bit of effort. With the inside clean I sanded the bowl and rim with 220 grit sandpaper and a medium and fine grit sanding sponge to clean up the finish. I was able to remove the darkening on the rim and also the dark spots on the sides of the bowl. I screwed the stem back on the shank and then sanded the stem with the same sandpapers as I had sanded the bowl. I removed tooth chatter and the calcification on the first inch of the stem. I worked on the slight tooth marks on the button itself and cleaned them up. The pipe was beginning to take shape. Much more sanding would need to be done to the bowl to remove all of the scratches left behind by the sandpaper and a lot of polishing would need to be done on the stem before the pipe was finished. I rubbed the bowl down with olive oil so that I could wet sand the finish and work out the scratches. I sanded the bowl with micromesh sanding pads and the olive oil until I was able to remove the scratches. I started with 1500-2400 grit pads and sanded until the scratches were minimized and then rubbed it down with olive oil once again before sanding with 3200-4000 grit pads. Each successive micromesh pad brought more of a shine to the briar. The fills became smooth and blended into the briar better and began to disappear into the briar as the scratches around the edges were smoothed out. I gave it a final rub down with oil and then finished sanding it with the last three grits of micromesh – 6000-12000. The bowl was smooth to the touch and had a shine to it that once was buffed and waxed would glow. I sanded the stem with micromesh sanding pads – wet sanding with 1500-2400 grit pads and then rubbing it down with Obsidian Oil. I continued to dry sand with 3200-4000 grit pads and gave it another coat of the oil. I finished by sanding it with 6000-12000 grit pads and then gave it a final coat of oil and let it dry. I buffed the pipe on the wheel with Blue Diamond polish and then gave the bowl and stem multiple coats of carnauba wax. I buffed it with a clean flannel wheel to give it a shine and finished by buffing it with a microfibre cloth to deepen the shine. The finished pipe is shown in the photos below. It is a beautiful old Grabow that has a lot of life left in it. Whether I keep it or pass it on to someone else it should last much longer than I will. It should continue to give companionship to whoever’s rack it graces. Thanks for looking. A favorite shape. Nice job as always Steve. And yes, 04 is the shape code, 97 was the finish code for deluxe. Also 92 and 98, there was more than one De Luxe, and 97 was the natural variegated finish. Dating on that if I’m not mistaken is between 1944 and 1953, at which point the spade was rotated so that the tip pointed to the bowl instead of the mouthpiece, after the company was purchased by HL&T. That is a true Linkman’s grabow, they just discontinued the Linkman’s stamp in ’44. I suspect it’ll find a place in your regular rotation. This entry was posted in Pipe Refurbishing Essays and tagged Bowl - finishing, Bowl - refinishing, bowl topping, Bowls - refinishing, Dr Grabow 9704, Dr Grabow De Luxe pipes, Dr. Grabow De Luxe 9704 Bent Billiard, Dr. Grabow pipes, finishing, micromesh sanding pads, Oxidation, pipe refurbishing, refinishing, refurbishing, removing oxidation, stem work, topping a bowl on November 29, 2015 by rebornpipes. In a trade with Dave Gossett I acquired this Kaywoodie Super Grain Apple. The bowl was in really great shape other than a few nicks and dents here and there. The finish was clean and the bowl had been cleaned and reamed. There were some small pin pricks on the back left side of the outer edge of the rim that looked to me were made when the pipe was dropped. They had been sanded a little so that the outer edge was no longer even around the bowl but sagged at this spot. The top of the rim was clean and smooth. The pipe was stamped on the left side of the shank with the words Kaywoodie over Super Grain over Imported Briar. The right side is stamped with the shape number 33. In looking through the various shape charts I found that the 33 was the stamping for a Large Apple (see the first photo below). The aluminum stinger had been broken off in the stem. It was hard to tell if I was dealing with what had originally been a four hole stinger or a three hole stinger. I know that many can tell the age on these KW’s by the stamping but I am not one of them. I knew that the three hole stinger/tenon apparatus was pressure fit in the stem and the four hole was threaded and screwed into the stem. Once I was able to drill out the broken stinger I would have a better idea regarding the type of stinger it had. The stem itself was fairly clean. There were some ripples in the stem on both the top and the bottom of the stem near the button. This told me that there were tooth marks that someone had either tried to buff out or sand out. These would need to be smoothed out. The interior of the stem and the shank were clean of debris and tar. The next three photos show the broken metal tenon in the stem and the state of the stem and bowl when it arrived. The briar has some beautiful straight grain and birdseye. I cleaned out the inside of the stem with pipe cleaner and alcohol and the drilled out end with cotton swabs and alcohol. I cleaned the new stinger/tenon the same way and polished it with 0000 steel wool. I applied twisted the tenon into the mortise and then applied glue to the end that would go into the hole in the stem. I pushed the stem in place on the glued part and let is set. I unscrewed the stem and set it aside to let the glue cure. I used an all purpose white glue to set the tenon in place because I wanted to be able to adjust the fit with heat. I topped up the glue around the end with some clear super glue. With the tenon in place it was time to clean up the damage to the stem. I sanded it with 220 grit sandpaper to remove the wavy lines and clean up the residual tooth marks. There was also a nick in the side of the stem on the underside so I cleaned up the taper there as well. I then sanded it with a medium and a fine grit sanding sponge to minimize the scratching. With the stem surface smooth it was time to polish it with micromesh sanding pads. I wet sanded the stem with 1500-2400 grit pads. I rubbed it down with Obsidian Oil before going on to dry sand with 3200-4000 grit pads. I gave it another coat of oil and then sanded it with 6000-12000 grit pads. I rubbed it down a final time with Obsidian Oil and let it dry. I sanded the bowl with 4000-12000 grit micromesh sanding pads to smooth out the outer rim edge and the sides of the bowl. I wiped the bowl down with some pipe polish. I buffed the bowl and stem with Blue Diamond polish and then gave it multiple coats of carnauba wax. I buffed it with a clean flannel buff and then hand buffed it with a microfibre cloth. The finished pipe is shown in the photos below. Thanks Dave for the opportunity to restem this beauty. It was a fun one to work on. Thanks for looking. This entry was posted in Pipe Refurbishing Essays and tagged Kaywoodie Super Grain 33, Kaywoodie Super Grain Pipes, KW Super Grain 33, micromesh sanding pads, pipe refurbishing, polishing a stem, putting a replacement stinger and tenon in a stem, removing tooth marks, Replacing a Kaywoodies tenon and stinger in a KW Stem, sanding a stem, shaping a stem, Stem repairs, stem work on November 28, 2015 by rebornpipes. This entry was posted in Pipe Refurbishing Essays on November 28, 2015 by rebornpipes. When I saw this old horn stem pipe on Ebay UK I immediately put in a bid and I won the pipe. It had a great striated horn stem that had lots of deep colours. The area in behind the button on the top and the bottom of the stem was really damage with large chunks of horn missing. On the underside of the stem there was a dark red stain in the striations of the horn near the button. The stem has a metal push tenon with a twisted stinger apparatus screwed into the end of the tenon. The metal ring between the shank and the stem was attached to the stem. The stem had a faint crown stamped in the horn. The bowl had a thick cake and the rim was heavily covered with lava that flowed over from the bowl. The underside of the bowl had a half-dozen fills in it that were shrunken and filled with white putty. The stamping on the shank said Windsor in a script with a flouring line underneath. Stamped under that was De Luxe. On the underside of the shank next to the stem it was stamped 13106. I have no clue as to the provenance of the pipe – WMTP says that there are several makers in England that made the brand. All have stamping that is slightly different. The finish on the bowl looked to be in decent shape under the grime and build up on the sides of the bowl. (Anyone have any ideas on the maker let me know). I took close up photos of the stem to give an idea of the damage that I would be working with on this pipe. On both sides of the stem there was serious damage in the form of missing chunks of horn. These chunks were missing in the sharp edge of the button and in the surface of the horn itself. The first and second photos show the top and bottom sides of the stem. In the second photo below there is a dark line at the bottom edge of the stem next to the button – that is the red mark that was in the surface of the horn. The third photo below shows the profile of the stem and clearly shows the missing chunks in the horn. The close up photo of the rim below shows the overflow of lava on the surface that would need to be removed to assess damage to the bowl and rim. The twisted aluminum stinger apparatus was hefty and at first glance seemed to be stuck in the tenon. I tried to turn it and pull it and it would not budge. I would need to heat it to see if I could loosen the tars that bound it to the tenon. I decided to work on the stem first. I enjoy working on and repairing horn stems. I find great satisfaction in bringing them back to life and bringing out the rich glow that come from a polished piece of horn. In this case I sanded out the damaged areas with 220 grit sandpaper to smooth the edges of the holes and to clean up the debris. I wiped it down with a cotton pad and alcohol to clean off all the debris. I decided to add a little colour to the horn before filling in the hole so that the darker striation would continue to the button. I used a black permanent marker to colour in a stripe from the place it ended on the undamaged portion back to the button. I filled in the damaged areas on the surface of the stem and on the button with clear super glue. The area on the underside where the red spot was cleaned up a bit but the red bled through. I added multiple coats of the glue to build up the areas. I overfilled them so that I had material to work with in reshaping the button and the stem surface. Once the glue dried I used a needle file and a coarse sanding stick to recut the edge of the button and clean up the top face of the button. I wanted a clean defined area that matched the undamaged part. I sanded the entire stem, carefully avoiding the area of the stamping with 220 grit sandpaper to blend the repair into the surface of the stem and to shape the button. I heated the metal tenon with a lighter and was able to unscrew the stinger from the end. I worked on the shape of the button and the flow into the button with sandpaper and sanding sticks. The shiny areas in the photo below next to the button are the patches of superglue. Much polishing still remains to be done at this point but the surface is smooth to the touch. I cleaned up the stinger with 0000 steel wool to remove the tars and tarnish. I cleaned out the inside of the stinger with pipe cleaners, cotton swabs and alcohol. I reamed the bowl with the PipNet reamer and took the cake back to bare wood. I wanted to check out the inside of the bowl for damage or cracks. Fortunately it was very clean. I scrubbed the rim with alcohol and cotton pads to remove the tars. It was very hard so I also used a 1500 grit micromesh sanding pad. I was able to get most of the build up off the rim. There was some darkening that I would need to sand with a more aggressive grit of sandpaper. I scrubbed the exterior of the bowl down with acetone on cotton pads as well to remove the grime and old finish. With the basic work done on the exterior I cleaned out the shank and the airway in the stem. I also scrubbed out the inside of the bowl with alcohol, cotton swabs and pipe cleaners. I put the pipe back together to get a look at how things were coming along. I wanted to see what the repaired stem looked like. In the photos below you can see the new look of the stem from all angles. I am pleased with the overall repair of the stem. I took the stem off the pipe and worked on it with the micromesh sanding pads – wet sanding with 1500-2400 grit pads and dry sanding with 3200-12000 grit pads. I rubbed the stem down with Obsidian Oil between each pad as I have found when working with horn that the oil gives it a better bite into the material and helps raise the shine. I lightly buffed the stem with Blue Diamond and then gave it several coats of carnauba wax. I buffed it with a soft flannel buff and then hand buffed it with a microfibre cloth. With the stem done I turned to the finish on the bowl. I used a dental pick to remove the putty fills from the bottom of the bowl and shank. I wiped the bottom of the bowl down with alcohol and then packed briar dust into the holes where I had removed the putty. Once the dust was packed in I put a drop of clear super glue on top of the dust and then packed it down with the pick. I added more briar dust to top up the fill. When the patches had dried I sanded them with 220 grit sandpaper to remove the excess material and blend the surface of the patch into the bowl surface. I heated the briar and then stained it with a medium brown aniline stain. I flamed the stain to set it in the briar. I buffed the bowl with Blue Diamond on the wheel and then gave it several coats of carnauba wax to give it a shine. I hand buffed it with a microfibre cloth. I pushed the stem back in place and gave the entire pipe a final coat of wax and then buffed it with a clean flannel buff. I finished by buffing it by hand with the cloth. The finished pipe is shown in the photos below. It is a beautiful pipe and the horn just shines. I am looking forward to enjoying it in the days ahead. What would you call this shape? Any ideas? This entry was posted in Pipe Refurbishing Essays and tagged Bowl - finishing, Bowl - refinishing, Bowls - refinishing, finishing, Horn stems, micromesh sanding pads, pipe refurbishing, polishing a stem, refinishing, refurbishing, removing tooth marks, repairing bite marks, repairing bite marks on horn stems, repairing horn stems with super glue, repairing tooth marks, repairing tooth marks on horn stems, restaining, restaining a bowl and rim, Stem repairs, stem work, Windsor De Luxe, Windsor pipes on November 26, 2015 by rebornpipes. I am always on the lookout for aged tobacco, whether it is in tins, boxes or foil pouches. I love the look of the old packaging and trying the old tobacco. On a recent trip to Idaho Falls I came across this pair of packets of Kentucky Club in one of the antique malls I visited. From a bit of research I found that the Original Kentucky Club pipe mixture was a mild blend of high grades of White Burley from Tennessee and Bright Virginias from Carolina and Georgia districts. The next two photos are advertisements for Kentucky Club that give a bit of feel for the age of the brand. I don’t what the age of the tobacco I found is but the fellow who sold it to me with two pipes thought it was from the 50s. So it has a bit of age on it. The two boxes were wrapped together in a torn brittle plastic package. When the shopkeeper gave them to me the plastic fell off. The two cardboard boxes are printed in basically three colours so it is not a modern printing process. The packaging makes me think the seller was correct in his thinking it came from the 50s. I picked up the two unopened boxes for about $8. The boxes are printed Kentucky Club White Burley Smoking Tobacco with a picture of a jumping horse. At the bottom of the box cover it says Guaranteed Fresh Net Wt. 1 ½ oz. with a picture of a blue pouch with the Kentucky Club logo. This is on both the front and the back of the box. On one of the long edges it reads Kentucky Club over TP-16, W. VA. Kentucky Club, Wheeling, W. Va. Union Made. Under that it reads Made in USA. There is a perforated PUSH IN tab on the top edge. On the other long edge it reads Kentucky Club over White Burley Smoking Tobacco. This side also has the PUSH IN tab at the top. On the top and bottom of the box it read Kentucky Club. I opened one of the boxes to look at the contents. Inside was a foil pouch of tobacco. The pouch is checker board black and blue. On one side is a silver medallion that has the words Never Tires Your Taste over Kentucky Club. On the other side it has a jockey and horse jumping inside a silver circle like the logo of the tobacco. The tightly sealed foil pouch let none of the aroma of the tobacco escape. That in itself was a good sign. The contents were a little dry as the tobacco was crunchy. Around the outside of the pouch was wrapped a coupon for a Millard Pipe. The combination of the design of the pouch, the packaging and the insert make me even more certain that the seller was correct in his general assessment of the age of this tobacco. I did a bit of digging to find out about The Millard Pipe – which seemed to have been a type of system pipe. I was able to find a Millard pipe through Google photos and it turns out that it was a pipe with a design very similar to a Keyser Hygienic Patent Pipe. The inner tube in the shank and a similar tube in the stem with a military mount stem. Now I am going to have to hunt down one of these Millard Pipes. This entry was posted in Pipe and Tobacco Historical Documents, Pipe Related Essays and tagged Kentucky Club Pipe Tobacco, Kentucky Club White Burley Tobacco, Millard Pipes, The Millard Pipe on November 25, 2015 by rebornpipes. This entry was posted in Pipe Refurbishing Essays on November 24, 2015 by rebornpipes.